Hey all, Ginny here. 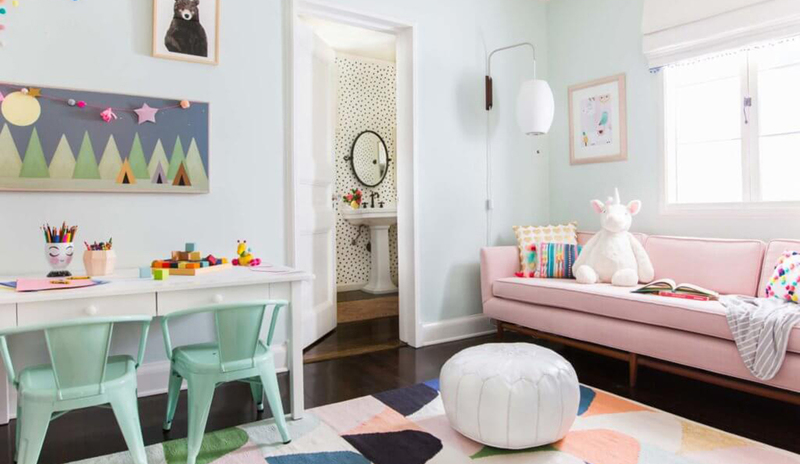 A few weeks ago Emily introduced a bright and cheerful playroom (click through in case you missed the intro). We recently finished the project up and got it shot and today I’m bringing you the full reveal. Let’s get into it. 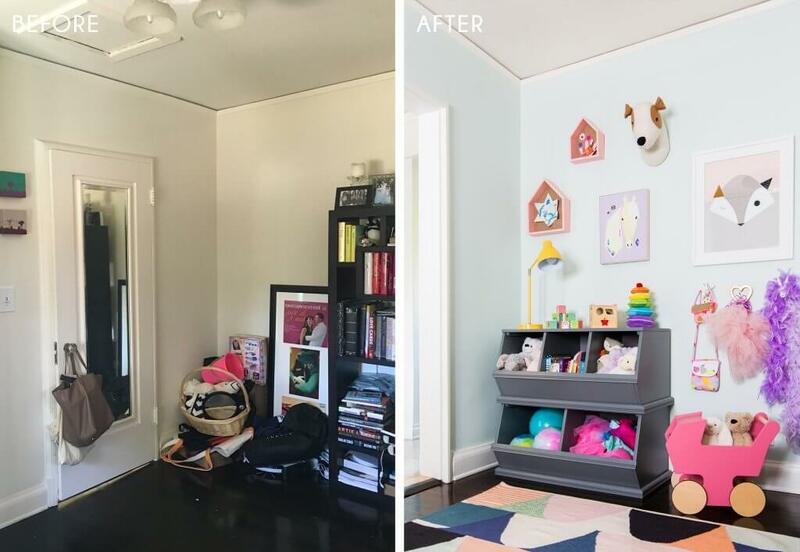 When we started the project last year the couple was quickly expecting their second child, so they wanted to create a dedicated playroom and space to store all their kid’s toys. 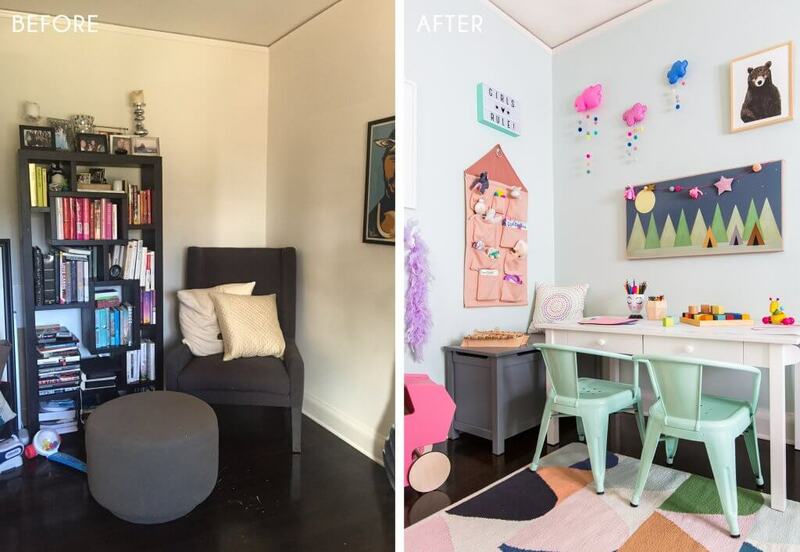 To accomplish everything they wanted for the room, we divided the space into two separate areas, a cute reading nook by the window, and then a crafting/arts/play space with storage by the door. Then in the attached bathroom, we made a few small changes by adding a fun metallic dotty wallpaper from Juju papers, and swapping out their old rectangular mirror to this black oval one. The new mirror helps to make that wall feel less heavy, and the organic shape makes it feel more playful against the beautiful wallpaper. The first thing we did was paint the room out in Benjamin Moore Green Cast. This gave the room a nice wash of minty-green without being too bold or overpowering. 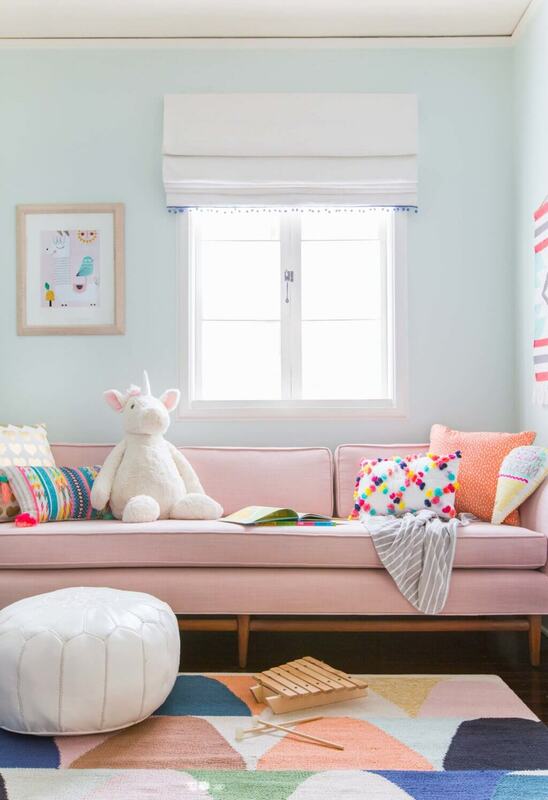 They already had the mid-century sofa which was in great shape and comfortable, so we reupholstered it in this gorgeous pink fabric from Fabricut to give it an update and make it work with the new design scheme of the room. We also had the fabric stain treated and backed prior to reupholstering to make it more durable for the kids. Above it we brought in the modern Nelson sconce to give some light to the little corner reading nook and create a soft ambient glow that allows for a more relaxed pre-bedtime reading vibe. 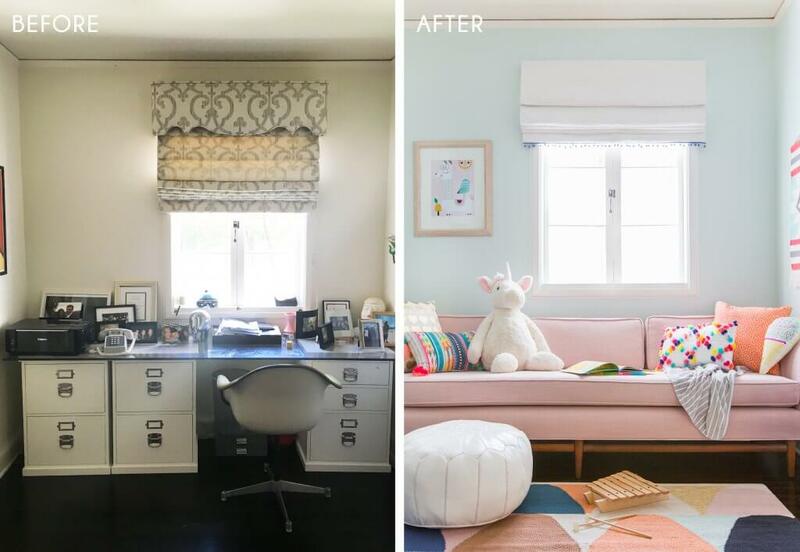 With the rug having lots of color and pattern in it, we opted for a more simple white roman shade, but added a cute trim detail to the bottom to amp it up a bit. 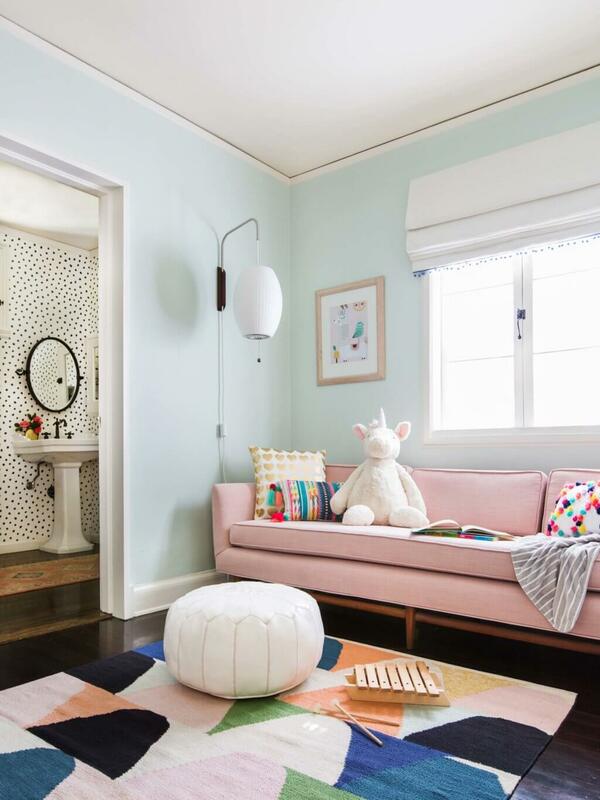 We knew that we’d eventually bring in colorful accent pillows on the sofa, art on the walls, as well the colorful kid’s toys – so keeping that window neutral would stop the room from feeling too overloaded with pattern and color. No reading nook is complete without a library of kids books at easy access, so we brought in this vertical bookcase for forward facing books. 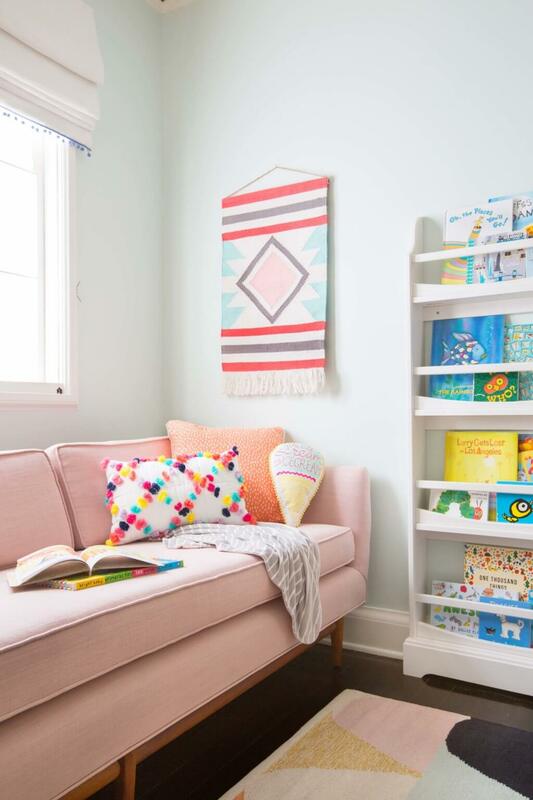 This serves as a fun pop of color (as mentioned above) to the room and also allows the kids to grab their favorite stories whenever they want. 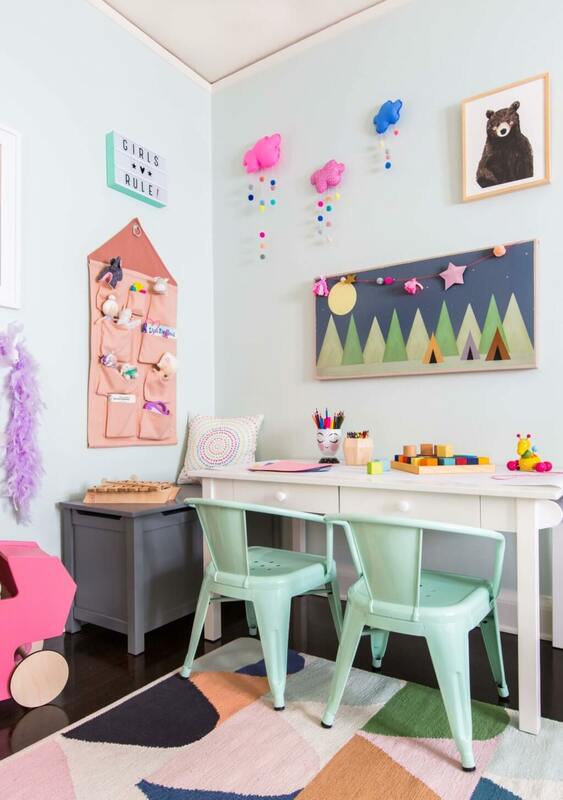 In the arts and crafts area we added this crafting table which can be made higher or lower by switching out the legs, making it a perfect piece for transitioning from a toddler to a big kid. The green chairs were brought in as they speak to the walls with the deep mint green color and make for easy clean up if something is spilled during crafting. Above the table we had some blank wall space so we made two fun gallery walls using a mix of flat prints and 3D elements like these adorable fabric clouds. To house all their supplies we mixed in different shaped cups and vases as a cute way to organize and store their pencils, crayons, and markers. The original packaging tends to get damaged pretty quickly, and can make it tricky for little fingers to pull out pencils and crayons. Storing art supplies out in the open can create a more inviting creative space, but the containers will help keep the space organized, yet fun. 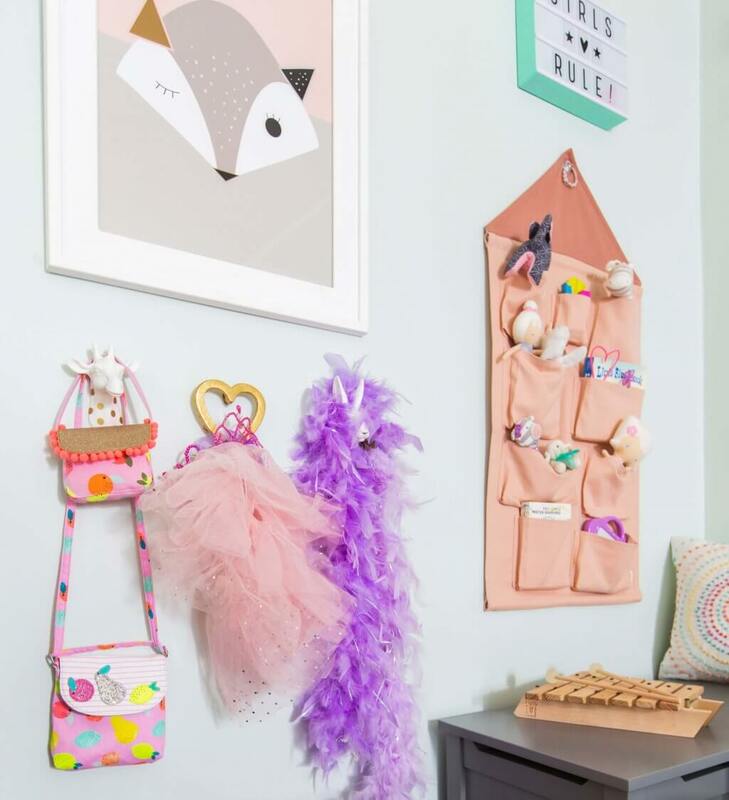 There is no such thing as too much storage in a kid’s playroom so we tried to give them a variety of storage to help with all their toys and necessities. 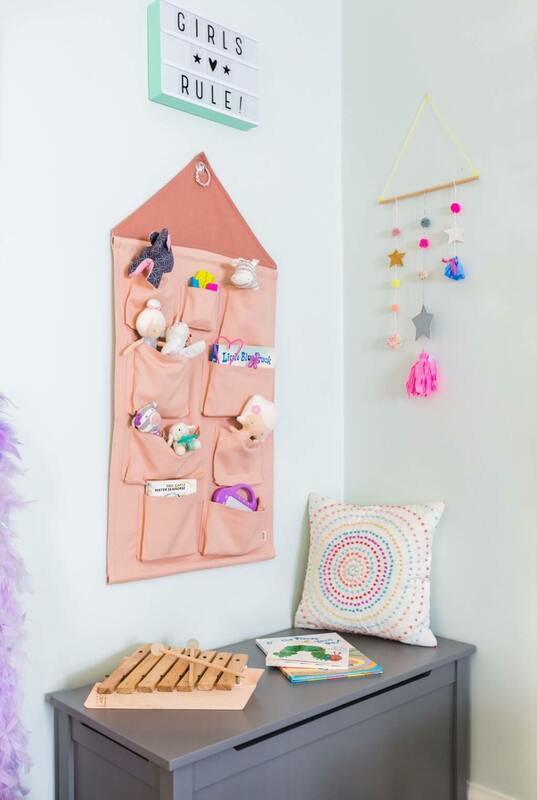 On the wall we put this hanging pocket organizer which can help tidy away smaller toys and books that would otherwise get lost in bigger bins, while the trunk allows for larger, less used items to be stored away. The trunk is also fairly sturdy so it can act as extra seating when friends come over or even for adults. Mismatched hooks on the wall served as a cute way to hang (and display) dress-up items, bags, or jackets. We installed them low enough so that the kids can reach them but still have space underneath to store moveable toys like carts and tricycles. On the other side of the wall we used these stackable open bins which make for easy access to the toys, and a quick clean up. To keep them organized and help the kids learn how to put their own items away we gave each bin its own category – balls, dress-up, books, soft toys. You could even label each bin which would make it an enjoyable yet educational way of keeping things tidy. Adding 3D art like the dog head and wood houses make the art wall feel more playful and interactive. 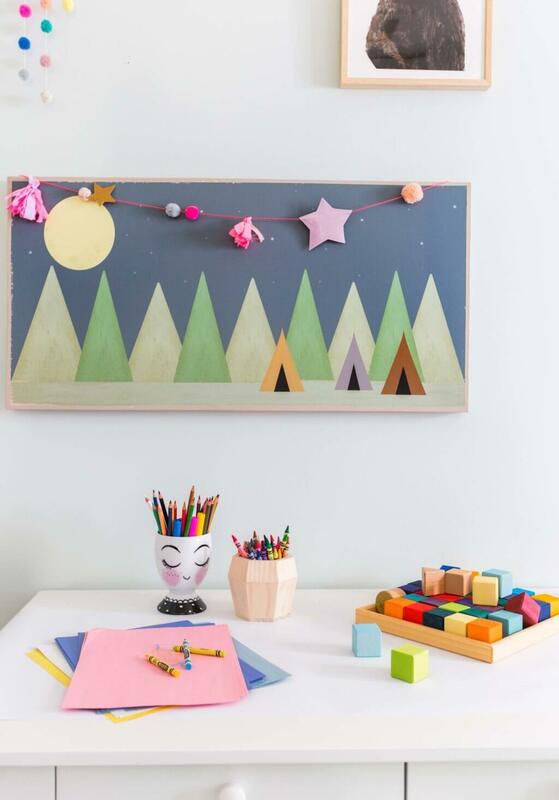 The houses have a pinboard backing which allows for small home-made pieces of art to be displayed, giving it a more personal touch and allowing you to swap in new pieces as they are created. 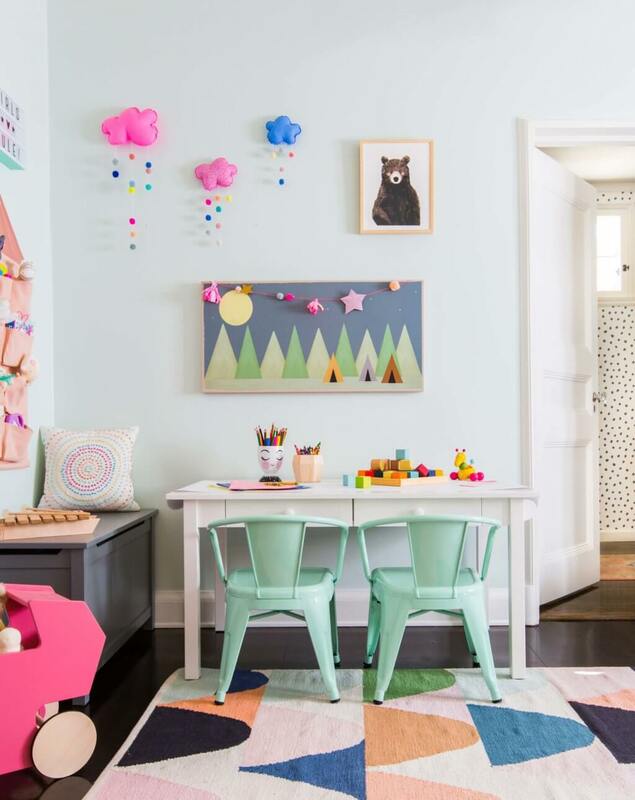 So there you have it, our bright and cheerful kid’s playroom. It has been such a fun project that we loved pulling together for a fabulous family. Let us know if you have any questions below and in the meantime we have pulled together some fun before and after images below. Such a fun transformation! The rug is my favorite piece.